This weeks Stan Shaw Daylight award for a selfless sacrificial act by a Black character in a movie so that the white characters can live goes to…. Envelope please… HILL HARPER in ‘The Breed!! !’ The room fills with mad applause. Now there is history behind the Stan Shaw Daylight award of course. Black characters have been sacrificing their lives in films for white characters for about as long black characters have been allowed to be in films, but in 1996 Sylvester made a little action flick called ‘Daylight’. This is a story about an explosion in some New York tunnel, closing it off, while the water is a rushing in. It is up to Sly to lead the survivors to daylight before they all drown. Now Black actor Stan Shaw plays a port authority cop or something who in death defying service to the other characters in the film breaks his back, but he lives. The other characters place him on a wood plank and with the water coming he’s just floating helplessly and it’s obvious that he has become a bit of a liability. His character convinces Stallone and them to go ahead and save themselves whilst he just continues to float, unable to move until the water eventually swallows him and he drowns to death. Stallone is like ‘thanks bro’ and off he goes. So there you go, this cat drowns to death, unable to move while water slowly creeps from the back of his head to his nose. Jeez, but a bullet in the brothers; head or something Sly! That was by far the worst I’d seen of a black characters’ sacrifice, but wait, it gets even worse. At the end of ‘Daylight’ when everybody emerges from the tunnel, Stan Shaw’s girlfriend looks at Sly hopefully, praying that her man is coming out too. Sly ruefully shakes his head no. But then some girls freakin’ DOG comes running out the tunnel, the happy music plays, everybody is filled with joy and the credits roll. Good Lord Jesus almighty. From that point on, Black characters now fight yearly for the Stan Shaw Daylight award, and this years award, though it’s early, goes to Hill Harper. Now Hill Harper is one of our finest actors, in my opinion, so I was a little surprised to see him in this kind of film taking this kind of role. Not in a negative way, because Lord knows I’m not going feed his children or pay the man’s rent, but nonetheless still a little surprised. As if I haven’t wasted enough time already, on to ‘The Breed’. A classic horror survival story about five young twenty somethings on a little weekend spring island getaway, until they run across a genetically engineered pack of rabid dogs. Now these dogs exhibit all the signs of rabid dogs, with the exception that don’t die. And they’re really, really smart. When one of the dogs bites pretty Sara (Taryn Manning) and Sara starts acting really weird, these guys know they are in trouble. Now if I’m a character in one these horror survival movies, I know I’m pretty safe until the Black guy dies, then all bets are off. So when Noah (Harper) announces he’s going in the basement to replace a fuse to bring the lights back on, and refuses help from the other characters, I would actually step in and announce that as long as we keep Noah alive, we all might survive and I would dispatch one of the other characters to change the fuse. Save the Black guy, save the world. Alas, Noah goes to change the fuse and would never see ‘Daylight’ again. 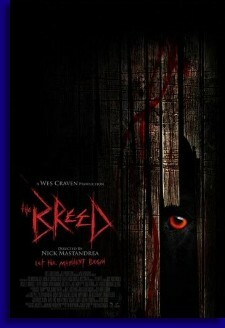 Honestly though, ‘The Breed’ formulaic though it may have been, wasn’t that bad a movie. I’ve never considered Michelle Rodriguez particularly hot, as she’s often playing this uber tough chick role, but she was looking quite tastylicious in this one. There was some pretty decent suspense, and the dogs were obviously well trained and quite frightening. Hill Harper’s purpose on the island was to be the dead black guy since there five main characters, Michelle Rodriguez’s character was paired with Matt (Eric Lively) and Taryn Manning’s character was jonesing for John (Oliver Hudson) so whose left for poor Noah? Well just horrible death I suppose. There are far worst ways to waste your valuable movie viewing dollar than ‘The Breed’. Better ways too, albeit, but worst as well. Hoo-ray mediocrity! Booo dead Black guys.